What Does a Nopal Cactus Look Like? Although cacti are are native to semi-arid or desert areas, they can benefit from fertilization. A number of commercial cactus fertilizers are available. Cactus fertilizer differs from other fertilizers in that it is much more diluted. Understanding that, making your own organic cactus fertilizer is very easy. Read the recommended mixing instructions for your organic fish and kelp emulsions. Add 1/8 of the recommended fish emulsion base to the recommended quantity of water. For example, if your emulsion recommends 1 tbsp. of fish emulsion per gallon of water, mix 1/8 tbsp. of fish emulsion in with 1 gallon of water. Add 1/8 of the recommended kelp emulsion base to your water. Kelp emulsion has a number of trace minerals that are generally beneficial to plants, including cactus. By mixing 1/8 of the recommended amount of both fish and kelp emulsion, you are making about a 1/4 strength cactus fertilizer. Close your container. Shake the container vigorously to start mixing the components. Allow the container to sit for two to three hours to ensure that the fish and kelp emulsions are properly mixed. Water your cactus with this low-intensity fertilizer in place of its normal waterings. Combine equal parts good-quality potting soil, rinsed gravel and sand in a planting area or a planter pot in a thick bottom layer. Plant the cactus into the planting hole or pot, then backfill with the mixture. Put a large rock by the cactus, right next to it. This will help it maintain heat during any cooler seasons or nights, as well as help it retain water. Do this if the cactus is planted in the ground. Water the cactus around once a month, depending on where you live and your climate. For dry hot climates, water it about once every two weeks. For wetter climates, make sure the cactus doesn't get more then a couple inches of water per month. Potted plants require more water than ground cacti. Keep indoor cacti near a window to get at least six hours of sunlight per day. Proper care will ensure that your cactus will have maximum flowering production and keep them healthy and beautiful. Position the plant so that it gets as much sunlight as possible. The plant favors as much sun as possible and only needs a few hours of shade during the night. Store the plant in an area that will never be below 60 degrees Fahrenheit. Depending on the climate, this might require you to bring the plant inside during the winter to avoid frost. Water the plant when the soil feels dry. Water until the soil is damp but not soaked. Water as often as needed to keep the soil damp but not soaking wet as overwatering will kill the plant. Fertilize the plant with a cactus fertilizer once per month. Use the fertilizer manufacturer’s instructions to determine how much to add to the dog tail cactus. Use fresh potting mix. The potting mix should be one that is designated for cacti because cactus plants need a potting mix that drains well. You should also have holes in the bottom of your pot to assist with the drainage. Set your Golden Barrel Cactus outside, or in a window that receives full sun. Water your Golden Barrel Cactus until the soil feels moist. Do not water the plant again until the soil is almost completely dried out. Golden Barrel Cactus plants are extremely drought tolerant and don't do well in soil that is sopping wet. Fertilize your Golden Barrel Cactus once each month, excluding winter months, with a low-nitrogen water-soluble fertilizer. For example, a 5-10-5 fertilizer would work well. Examine your Golden Barrel Cactus once per year to see if it needs to be transplanted to a new, larger pot. Although these plants grow slowly, they will eventually reach about 3 feet tall and 3 feet wide. A pot that can accommodate that size will be necessary. Place the screen on the bottom of the planting container to prevent soil from washing out the drainage holes. Fill the container with 2 to 3 inches of potting mix. Loosen the cactus carefully from its current planting container. While wearing the gloves, gently lift the cactus from the soil. Use the tongs to prevent jabs from cactus spines, if necessary. Set the cactus plant into the new planting container so the crown of the plant is just below the rim of the container. Add more cacti potting mix to the container, filling the container up to the crown of the cactus plant. Firm the soil gently with your hands to finish transplanting the cactus. Place the cactus in a location where it receives about half the usual amount of sunlight during the first month after transplanting. This will lessen transplant shock and help the cactus acclimate to the transplant. Water the cactus for the first time about one week after you transplant. Resume your regular watering schedule at this time. Place the prickly pears in a large saucepan. Cover them with boiling water, and let them sit 2-3 minutes to soften their stickers. Pour out the water. Peel the prickly pears, and cut them into chunks. Place the prickly pear chunks in a medium-size saucepan. Add enough water to cover them. Boil 5 minutes on high heat, and then remove from heat. Pour the boiled water and prickly pears through cheesecloth into a large bowl or heat-tolerant pitcher. Throw away the seeds, draining as much of the juice as possible. Stir in sugar and lime or lemon juice, and then allow the juice to cool. Store the cactus juice in the refrigerator in a sealed container. Line the bottom of a growing container with small pebbles. Add a 1-inch layer of coarse sand on top of the pebbles. Fill the growing container three-quarters of the way with cactus-growing mixture. Plant the epiphyllum orchid cactus at the same level it was growing before and water it to lightly moisten the soil. Place a 5- to 6-inch climbing structure, such as a stake or small trellis, into the soil. The stake should be 3 to 4 inches from the base of the plant to avoid disturbing the roots. Move the container to a location that receives plentiful, indirect sunlight. An east- or west-facing window is ideal. Water whenever the top 1/2-inch of soil feels dry. Fertilize once every two weeks with cactus fertilizer during the spring and summer months. Do not fertilize outside of the growing season; the plant must go dormant to bloom again. Reduce watering in winter. Add only enough moisture to keep the soil from drying out completely. Resume normal watering and fertilizing in early spring. Place the plant is a room that receives indirect sunlight during the day. Water the plant's soil when the soil is extremely dry. The cactus can withstand a lack of moisture and can wilt if over-watered. Add water to the soil until it moist, but not soggy, to the touch. Move the cactus in the fall to a cool room that is dark from the evening until the early morning to promote flowering. The Thanksgiving cactus needs a dark environment that is no hotter than 65 degrees Fahrenheit during September and October, before it starts flowering. Limit watering to every other week during February and March, after the flowers have fallen off the cactus and the plant is in its resting period. Increase watering during the summer. Dip your pruning shears in isopropyl alcohol to sterilize them, and clip the top of the cactus' stems to pinch back the plant. Pinching back, which you should do between April and June, sends a signal to the cactus to regenerate the clipped area, which occurs in September and October in preparation for new flowers. Fertilize the plant every two weeks during April through June to promote growth. The fertilizer should be balanced to 10-10-10 formula. Nopal cactus grows round pads that are flat and have thorns. Green in color, the pads grow one on top of the other. The Spanish term for these pads is nopales. When left to grow, the cactus grows to 15 feet tall. 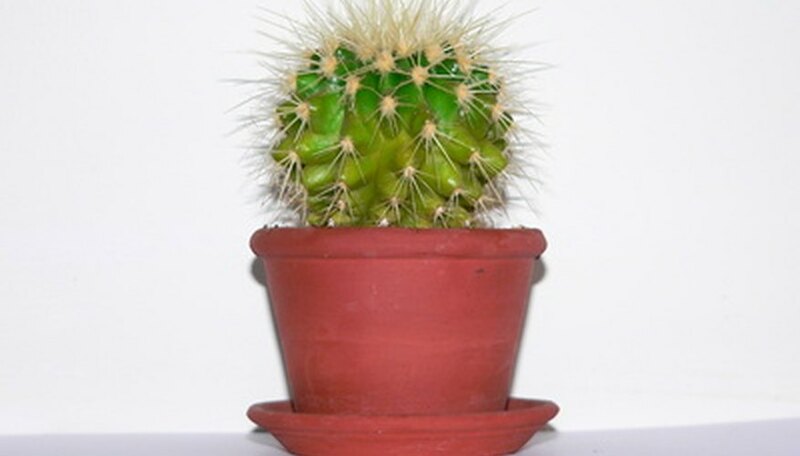 Careful handling of the cactus is important as the outside of the plant has sharp spines or thorns in several places. Fruit grows on Nopal cactus in a small walnut shape. The fruit grows in the early spring and shows a variety of colors ranging from red to yellow to brown. Flowers bloom on the end of the fruit and when the bloom dies in late spring, the fruit is ready to eat. White-skinned varieties of Nopal cactus are favored among Mexico residents while the juiciest and sweetest fruit has a dark red or purple color. Special techniques to remove the thorns or spines enable the user to eat the cactus either fresh or cut into strips and used in cooking. Eat Nopal cactus raw, fried, pickled or added to casseroles. Additionally, use cactus in jams, jellies and candy. Nopal cactus is believed has medicinal value as well. The sap, or water, inside the pads are applied to burns or cuts to aid in healing. Pureeing the young pads and consuming is said to be a natural laxative. Eating the plant might aid in controlling blood sugar for diabetics too, several clinical studies have been conducted. Nopal cactus is available in health food stores in dehydrated or powder form. Taken daily, it aids in the treatment of stomach ulcers and is used as an antioxidant. The popularity of Nopal cactus has now spread to other countries. Fill the container with loamy potting soil and plant the seed 1½ inches beneath the surface. Water the seed and wait for it to sprout. Water the plant once during its first week after sprouting to avoid over-watering. Continue faithful watering and place where it will receive primarily filtered sunlight. This cactus only requires water every three to four days so that the soil is permitted to completely dry out. Fertilize monthly after its first growing season from spring until winter. The cactus will bloom in its second or third year.